The calcaneus is the largest bone of the foot skeleton. 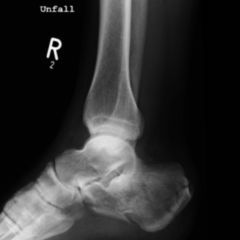 It is a part the structural assembly of the lower ankle and serves as a lever arm for the flexors of the lower leg which fix onto it via the Achilles tendon. The calcaneus has a cuboid basic shape and has 6 faces. facies articularis talaris anterior Between the facies articular talaris posterior and media lies the sulcus calcaneus. It forms together with the sulcus talaris of the talus the so-called tarsal sinus, a tunnel which houses the ligamentum talocalcaneum interosseum. 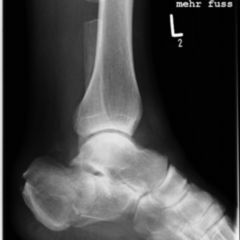 The facies articularis talaris posterior is involved in the structure of the posterior subtalar joint (articulatio subtalaris), the facies anterior and facies media in the structure of the anterior subtalar joint (articulatio talocalcaneonavicularis). The small, rough bone surface in front of the articular surfaces serves as the origin of the musculus extensor digitorum brevis. The facies inferior is uneven and wider at the rear than the front. They are separated posteriorly by a prominent elevation, the heal hock ( tuber calcanei). 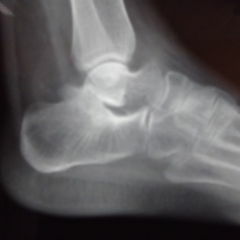 The Achilles tendon is fixed to this. The tuber forms a small bony protrusion (processus) at each side. The processus medialis (tuberis calcanei), attached to the "inner side", serves as the point of origin for the musculus abductor hallucis and musculus flexor digitorum brevis. From its base up to the lateral process (tuberis calcaneus), which is located on the outside of the foot, runs the original face of the musculus abductor digiti quinti right across the bone. There is a centrally extending recess between the two processes. More anteriorly to the processus are the two heads of the musculus quadratus plantae, attached medially and laterally. 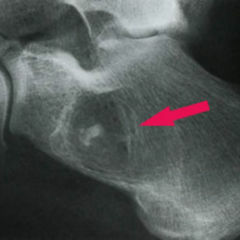 The medial side of the calcaneus is concavely formed. A striking, horizontally extending bony prominence, the sustentaculum tali, is found at its cranial end. The underside is channel-shaped up to the sulcus tendinis musculi flexoris hallucis longus and takes in - as the name suggests - the tendon of the musculus flexor hallucis longus. The lateral side of the calcaneus has a slightly bulging bone protuberance ( trochlea fibularis calcanei). Beneath the peroneal trochlea lies the sulcus musculi tendinis peronei longi which receives the tendon of the musculus peroneus longus. The bone core of the calcaneus develops between the 4th and 7th foetal month. The calcaneus serves as a lever arm for the major flexors of the lower leg muscles.